A long, long time ago on April 14th in the year 2013 and far, far away on an Island off the southwest coast of Canada lived an artist. This wasn’t just any island. It was the most beautiful Mayne Island with its own Ferries that were so big they could carry people, cars, and trucks from other far away and not so far away places. The artist who lives on this island is no more and no less eccentric than artists anywhere else in the world. 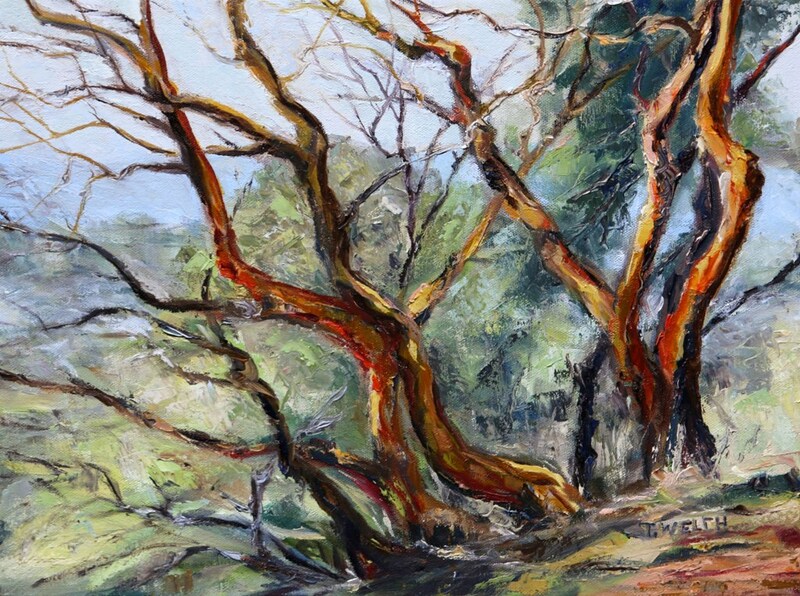 She often paints out in the open air or “en plein air” – very French! 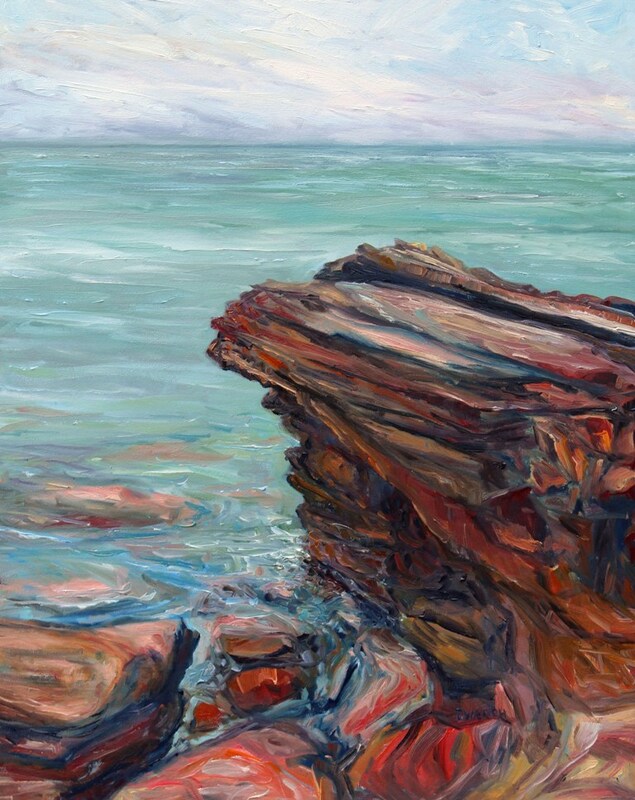 She paints painterly paintings mostly wet-on-wet or “alla prima” – more French! 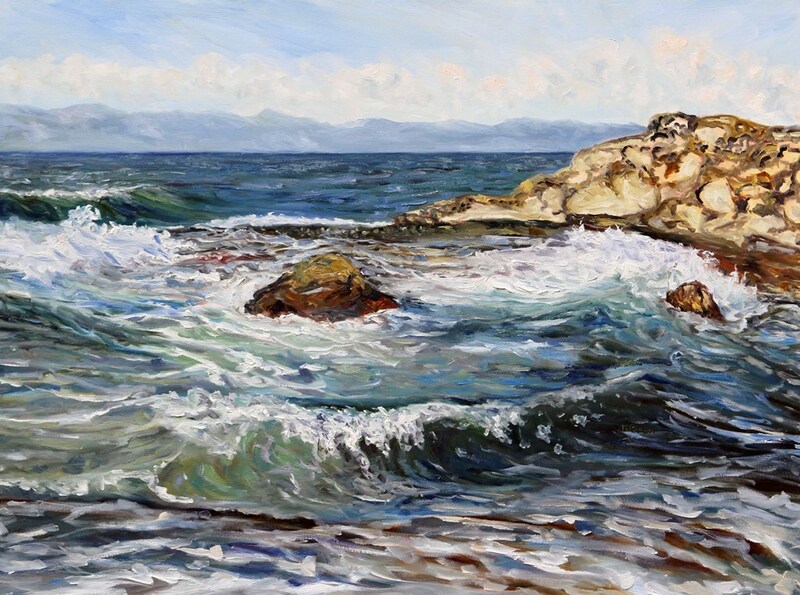 And though she is often referred to as “the Monet of Mayne Island” she is not even a tiny bit French and has never been to France. Her two children did do their primary schooling in French and this is about a close to anything French as this artist has ever experiences. But this would be another tale from even longer ago. So let’s get back to the story of the three Sunday to Sunday painting sales that began so long ago. The morning of April 14, 2013 begins with rolling low clouds and a slight promise of breaking sun. The artist has risen from her bed next to the tall fir trees and the stars. She drinks her coffee and packs her French Box easel, paints, jars, linseed oil and brushes into Red Rosie her almost, sort of, still very new Outback Subaru. 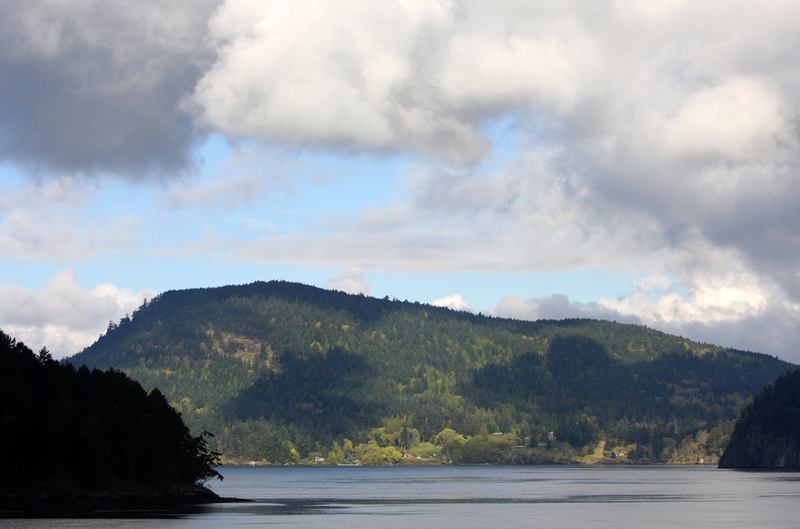 Then, humming one of her mostly tuneless tunes, she heads off down a slightly bumpy road to Miner’s Bay and the Mayne Island shore next to Active Pass. She had a plan. Today she was going to paint the Springwater Lodge. While she works the light across Active Pass is dancing shadows onto Galiano Island. 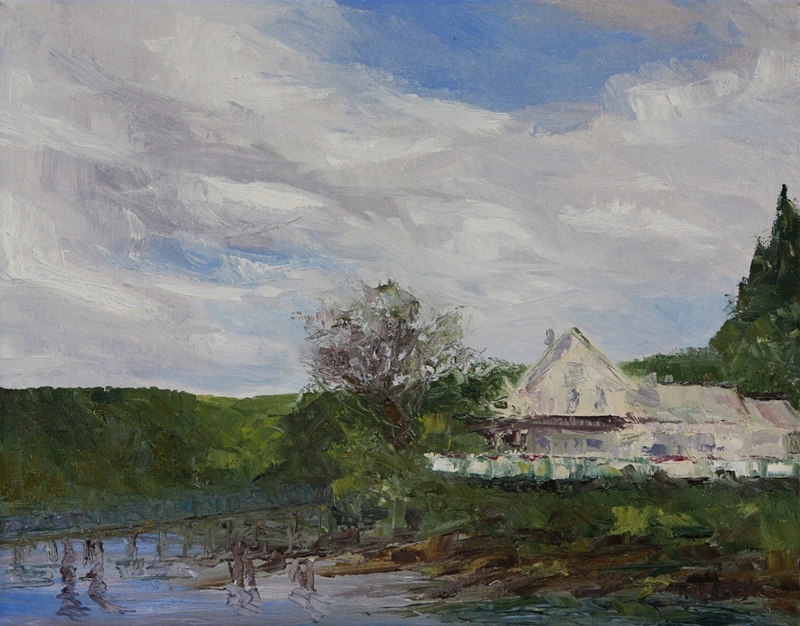 The artist knew she didn’t have time to paint the scene and she also didn’t want to stop working on the plein air painting of the Springwater Lodge. So she quickly photographed some reference images for later. Still glancing over her left shoulder now and again, the artist continues to paint in her painterly fashion the painting of the Springwater Lodge on an 11 x 14 inch canvas. The plein air painting sold almost immediately and it has long since been keeping an art collector in Alberta company. 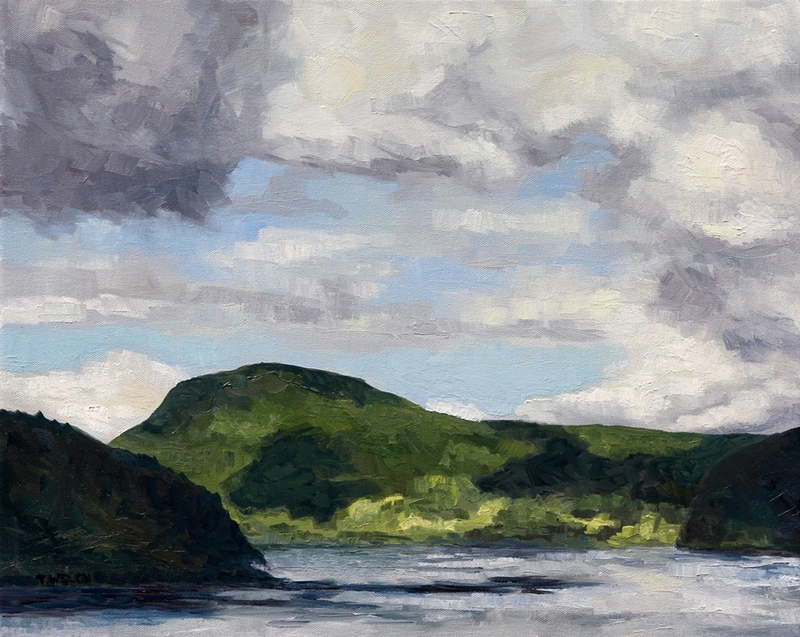 But the rolling clouds across Active Pass and magical light of that morning kept poking and prodding the artist when she was back in her small loft studio. So, like most inspired artists, she takes up the task of painting the scenes generous gift of a very fine moment. Five days later the second painting inspired by the Springwater Lodge plein air session is completed. But spring is not over and the greens of new leaves and new growth also held the wonder of Tulips. Red tulips. Red tulips that are a signature presence every spring on the deck of the Springwater Lodge. 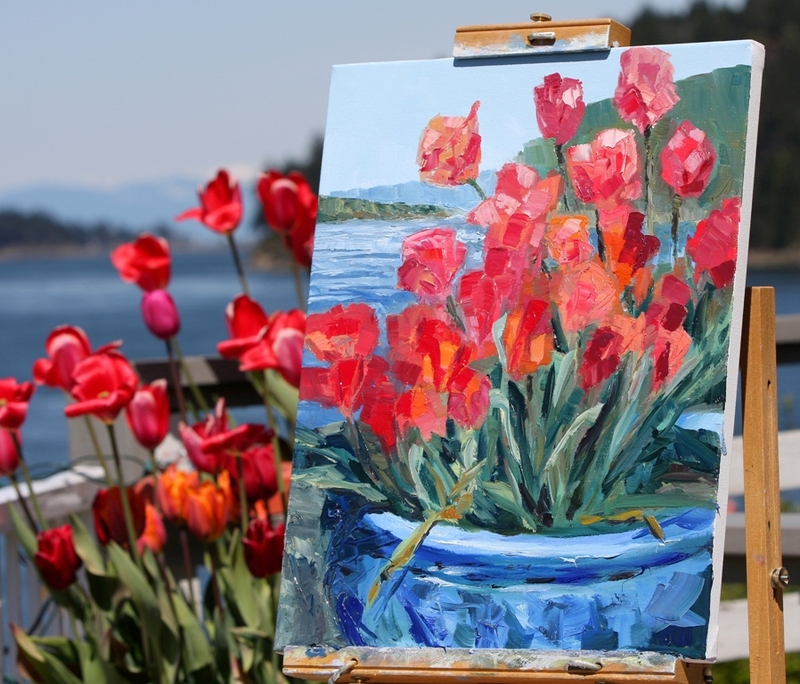 The red Tulips beg and plead with the artist to be captured on canvas So the artist asks and the owner of the lodge says yes. 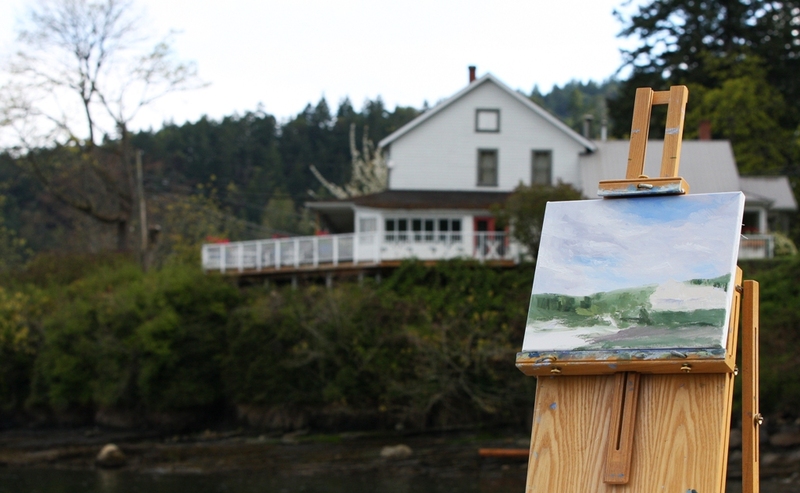 A few days later, the artist picks a perfect day and she sets up her French Box easel on the Springwater Lodge deck and she paints. She is so inspired that she goes back to the studio and over the next couple of days she paints a second painting. The paintings are obviously sisters but so very different from each other. What about you? Do you have a preference for one painting over the other? If so which one and what is it that has it being your favourite? The answers came from far and wide through Facebook, Twitter, Google Plus and the artist’s Creative Potager Blog. Most art lovers, art collectors and”fans of the artist’s paintings” like the first painting best as they appreciated the clear colours and freshness of the work. However, there are more than just a few who like the second studio painting as they see strength in its more weathered feeling. One collector who saw the two sister paintings even liked both and was considering purchasing the pair for a wall in her bedroom. But then she made possibly an unfortunate mistake. She told the artist that she wanted to wait for awhile before purchasing the two sister paintings. The art collector told the artist to leave the paintings on the market and if the artist sold them before she was ready to make her purchase then this would be fine – she would just choose something else. The artist looks at the two sister paintings and she looks at the list price of $1,280 for each painting and says something she will never say again. “Oh, I don’t think they are going anywhere very fast,” she says with confidence. The artist should have known better. She should not have tempted fate with such a comment because she knew her paintings were selling quickly. They were selling while still in progress. They were selling wet. They were selling when they were first release. They were selling when studio visitors came to her home studio. To put it simply, the artist’s paintings were selling, selling, selling. But… she thought, maybe not the tulip paintings. They were a little larger then those that were flying out of studio before the artist’s brush came to rest. Besides, $1,280 each is a lot of money for a painting, no matter how much a buyer might like them. The artist never thought anymore about it. Spring gave way to summer. The grass eventually lost its green to the soft glow of August sun-kissed golds. During this time, unbeknownst to the artist, a buyer had been thinking about the second painting every since it was first posted and the artist had asked viewers which painting they preferred. At the time the buyer’s father was dying. She loved her father and she couldn’t help but connect the weathered beauty and strength of the second sister painting to her love for her father. She preferred the second for its weathered and not so pristine feel of strength – like her father and like his and also her life on the prairies. Over the months since the painting was released for purchase the buyer returned many times to look at both paintings. Her preference never changed – it was and is the second of the two sister paintings. 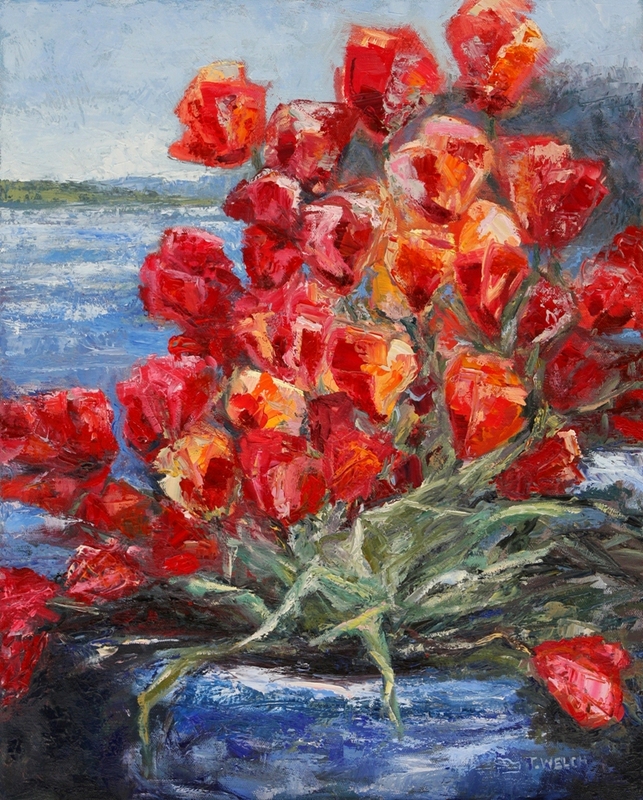 After months of consideration, the buyer contacts the artist and the second 20 x 16 inch oil on canvas sister red Tulip painting is destined for a new home in Saskatchewan, Canada. So feeling a little teary-eyed about the emotional connection this painting will have for its new owner the artist agrees to frame the painting as requested and prepare it to be collected a little later in the fall when the buyer comes west for a visit. Now the artist did have one more task she had to do. Can you guess what it was? The artist must now contact the other buyer who was interested in buying both sister paintings but had hesitated. 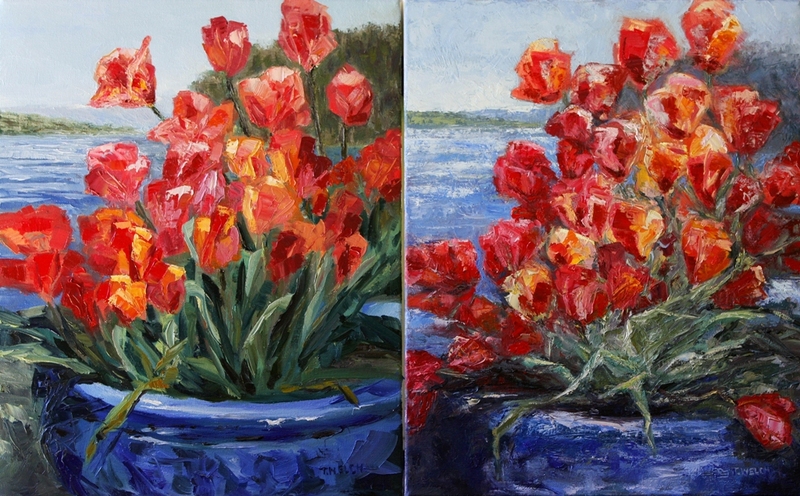 The artist must now tell her that only one of the sister red Tulip paintings is left. The artist knew that the art collector was mostly teasing and that she really did understand. The art collector said she was happy for the other buyer and for the artist alike because it was a beautiful painting and deserved a good home. But the artist knows that the collector is disappointed. Worse yet, the art collector is bringing a friend and coming for a home studio visit on the following Saturday. Even though she knew she had no reason to, the artist is feeling rather out of sorts about the whole situation. What can she possibly do? Well, the first thing artist did was nothing but sleep on problem. When she wakes the next morning she has an idea. While she is still thinking about her idea, she has to go to the “little city” for a couple of days. She buys two matching frames and one more for the second of the two sister paintings that had already sold the Sunday before. 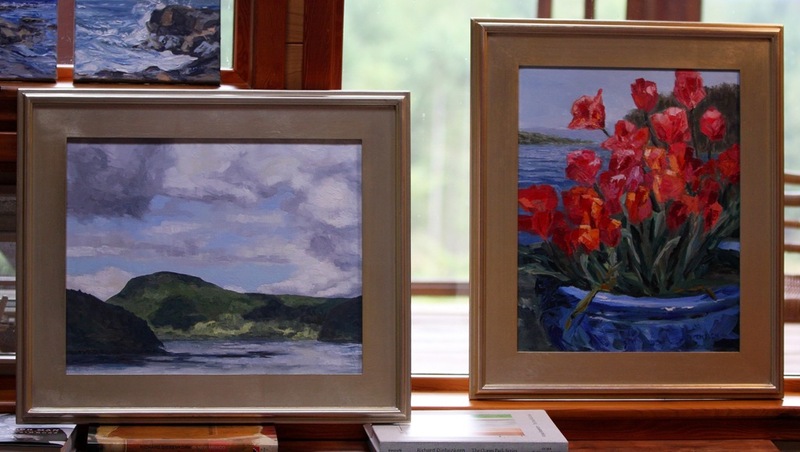 The artist explains that these two paintings were painted in the same season only days apart and that if the painting on the left was hung so that the waterline was level and a bit of space was left between the two paintings it would be like looking out two windows into Active Pass from the Springwater Lodge deck. The artist apologies for having a wall in her home studio to properly demonstrate as she hold the painting on the left at the appropriate height for the buyer to see what the artist is describing. The artist put the painting down. The visitors and the artist moved on. The visitors go up stairs with the artist to see the very large grand paintings in the loft studio. These are huge paintings. Two paintings 36 x 60 inches and one is 36 x 72 inches of oil on canvas. The visitors admire and discuss where if one had the money and room one might put one of these big paintings. As they are all about ready to return downstairs again, the art collector looks back down the stairs of the loft to the window where the artist had previously shown her the possible pairing the two of paintings. The collector pause one of those long pauses. The studio guests decided on water as they are descending the stairs from the loft studio. The art collector goes back to the two paintings. The other guest goes off to use the facilities. This time the art collector did not hesitate when considering her purchase. A mutually agreeable price for the two paintings was quickly reached by the art collector and the artist. Before the other studio guest returned to the room the two paintings are purchased by the art collector and a plan is made for the artist to personally deliver the two paintings to the collectors home before the end of August. 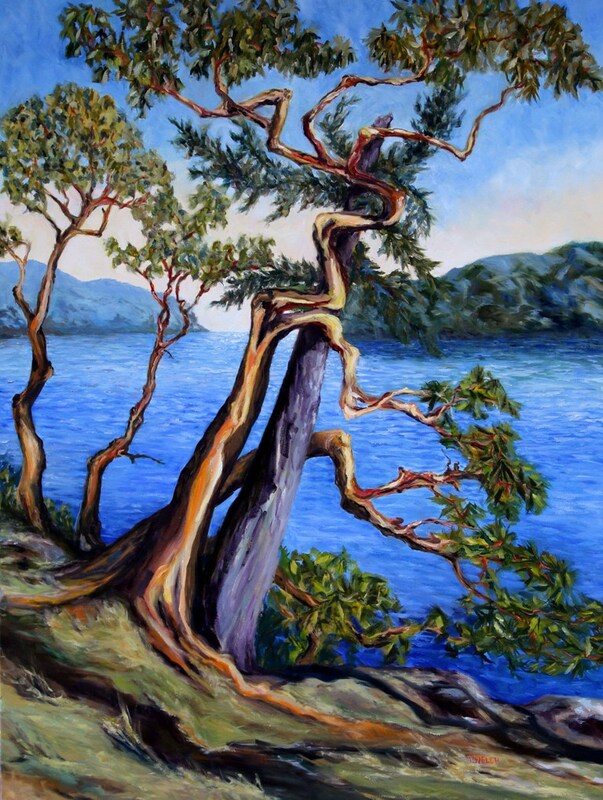 This is the story of the sale of three 16 x 20 inch oil on canvas paintings by the artist Terrill Welch from one Sunday to the next Sunday on the small Mayne Island off the southwest coast of Canada. Most of the artist’s current work that is available can be viewed and purchased in the Artsy Home online gallery HERE. What spring to summer story do you have to tell from maybe or maybe not so long ago? WARNING: Due to the high volume of sales in recent months, the price of current and new art work is anticipated to increase for a second time this year on or near October 1, 2013. 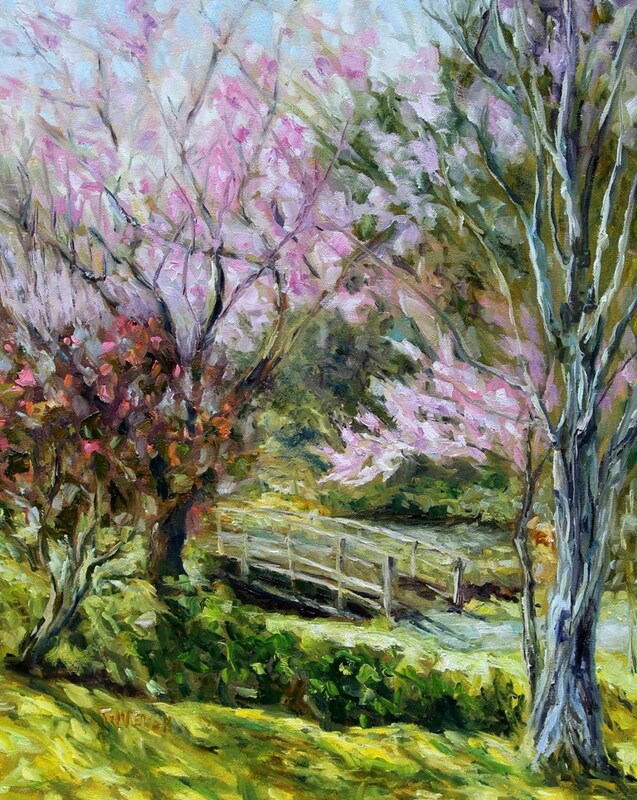 If you are seriously considering buying one or more of this artist’s paintings, it is strongly recommended that you do not hesitate – though, you will never ever here the artist say that she does not expect a painting to sell anytime soon – ever again. If necessary, ask the artist about making special arrangements such as her lay-away plan. Born in the village of Vanderhoof in north-central British Columbia, Terrill Welch’s art training came at an early age and continued more in the European style of mentoring and tutoring. 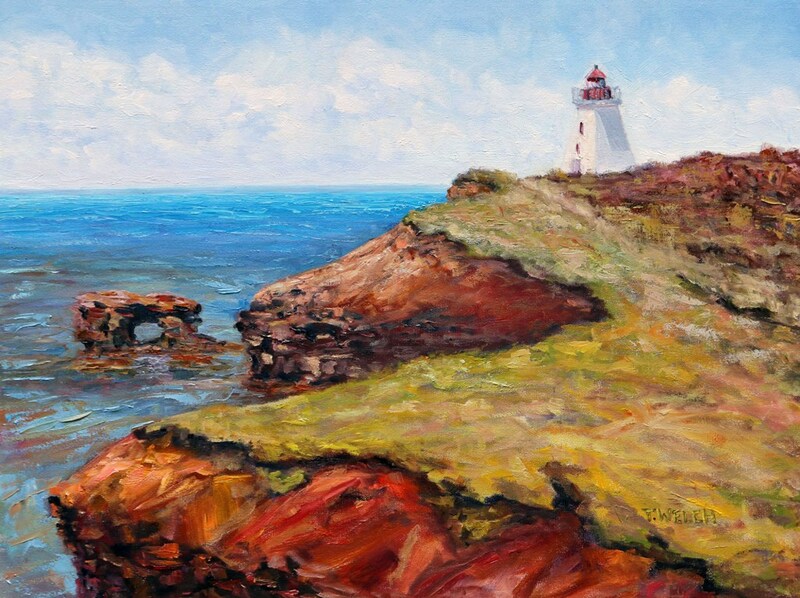 Terrill Welch’s work, in water mixable oil paints and photographic prints, showcases the beautiful, mysterious and rugged southwest coast of Canada. 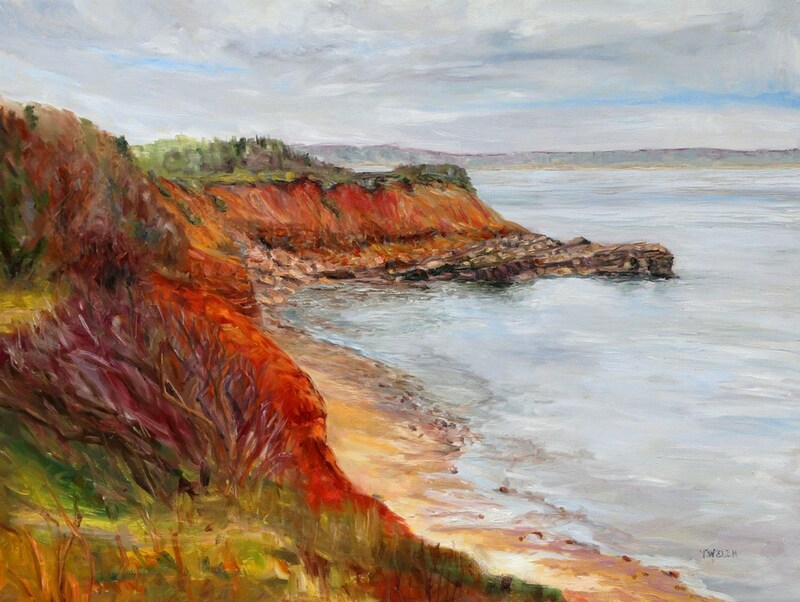 Though locally appreciated, Terrill Welch is internationally recognized.Her paintings and photographs are sold to art collectors throughout Canada and the United States as well as in Australia, England, Norway and Switzerland. So glad you had time to drop by Laurie during this quietness of late summer. Yes it is a valuable lesson and also a solid reminder to just paint. I am setting up a still life with a large vase of sunflowers and other hot coloured beauties today and including some golden plums. Looks like it should be eaten instead of painted. Thank you for sharing your experience. We had the pleasure of visiting your beautiful island last Monday and it is a lovely place. I really enjoy looking at your paintings now that I have visited some of the locations in person. It does seem to make the enjoyment of the paintings all that much deeper Deb to have been here either through my photographs, writings or in person. So glad you were able to visit. Next time do give me a call and come on by the studio if you like.